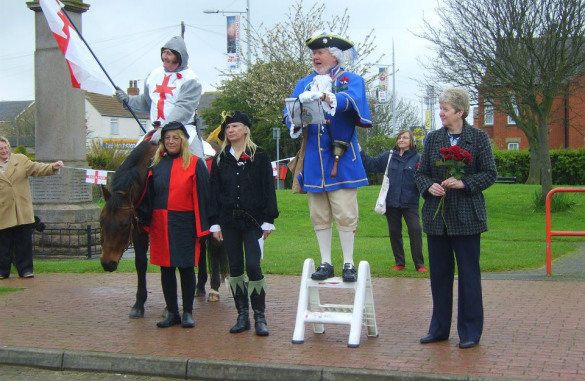 The St George’s Day parade is once again scheduled for April 23 and the parade will be passing through Mablethorpe High Street. The parade will have ‘St George’ on his horse at the front followed by the official procession plus Roy Palmer, the town crier, and they will make their through the town at approximately half past eleven in the morning. There will also be an official proclamation and this will be made outside The Factory Shop which is located in the High Street. This will be at around a quarter to noon. However, there will be something new about this year’s celebration because a new event will be taking place in the afternoon as well. There will be a show at the grounds of The Bacchus Hotel in Sutton on Sea and these will include my fair lady, George and the dragon plus other different entertainment forms and for a small charge, there will also be refreshments available. The event will be starting at around fifteen minutes past two so be sure not to miss it. St George’s Day is observed throughout England and is used to remember the patron saint of England, St George. The day is marked on the anniversary of his death i.e. 23rd April and this day was once a national holiday. Legend once had it that he was Roman army soldier who saved a princess and killed a dragon. The day is usually celebrated with parades among other forms of entertainment and some people also fly flags with St George’s cross from buildings and some people even wear a red rose on their lapel. St George’s Day isn’t a public holiday so you still expect stores, businesses, schools and other organisations to be open and public transport systems should be operating as usual. St George was born in the part of the world that now forms Turkey in the year 280. He was a soldier in the Roman army and rose up the ranks until he eventually became the personal guard of Emperor Diocletian. On April 23 303, he was executed for being a Christian and is now buried in Israel in the town of Lod. The legend of St George killing a dragon is what he’s most associated with. At some point, St George’s Day was marked with as much enthusiasm as Christmas but this changed in the 18th Century.